Dodge These Top 10 Marketing Mega Don’ts! Don’t let simple mistakes cost you business. 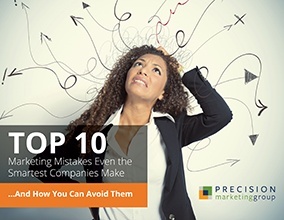 Our free guide reveals 10 of the biggest marketing blunders B2B companies make AND the easy ways you can avoid them. Think your work will speak for itself? Think again. Every day, great companies take a backseat to second-rate competitors — just because the other guys have a better strategic marketing plan. So what do you need to look out for? And how do you dodge these marketing mega don'ts? Don’t talk about yourself; talk about the problems you can solve. Compel new audiences to take action; remind existing customers why they love you. Start marketing with a plan… and a list of measurable goals - plus lots more! It's time to finesse your marketing plan and get a leg up on your competitors! Fill out the form to get your free guide right now. Simple as that!